ExtraMAME - a small MS Windows compatible game GUI wrapper for MAME, the Multiple Arcade Machine Emulator authored by Nicola Salmoria and the MAME team. ExtraMAME let's you play thousands of old-school arcade games on your computer. ExtraMAME is smaller and easier to use. It doesn't force you to fuss with difficult configurations and it's compatible with all MAME games. ...... Download the latest version of "ExtraMAME"
2. Install "Extra MAME" into a folder of your choice. For example: "c:\extramame\"
3. Install "Windows command line binaries of MAME" into this folder as well: "c:\extramame\". 4. Run "ExtraMAME". It displays two lists, "supported" and "available". 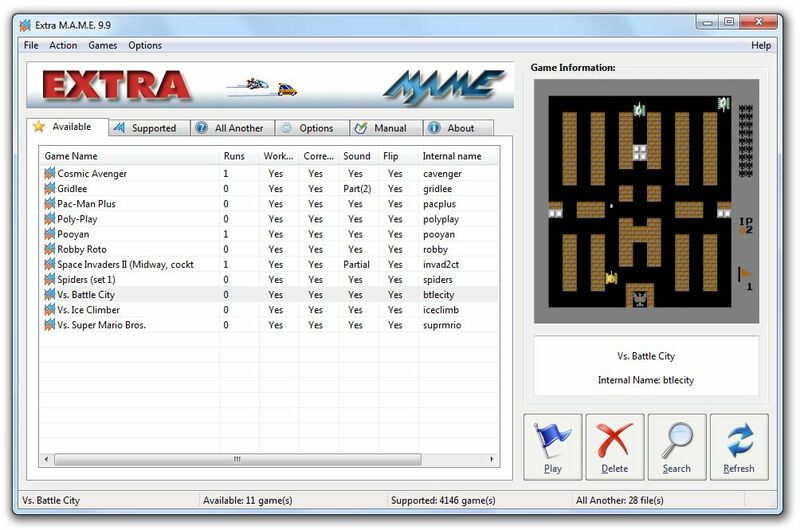 The supported list displays the names of games that are compatible with M.A.M.E. The available list displays the names of games that are actually present on your system. After a fresh install, the available list should be empty. You'll also need to download special M.A.M.E. game files. These files are named "bios" files and "rom" files. What are these "bios" files? These "bios" files enable MAME to emulate various kinds of game hardware. Where do I find these "ROM"-files? What are they? On the internet! These "rom" files are the actual game files themselves. For example, say you want to play the game "Bad Dudes vs. Dragonninja"
Qweas is providing links to ExtraMAME 12.3 as a courtesy, and makes no representations regarding ExtraMAME or any other applications or any information related thereto. Any questions, complaints or claims regarding this application ExtraMAME 12.3 must be directed to the appropriate software vendor. You may click the publisher link of ExtraMAME on the top of this page to get more details about the vendor.